01 July 2013 Special celebrations are taking place on July 6 to mark the 150th anniversary of Ellesmere Port Station, Little Sutton Station and the rail line between Hooton and Helsby.The Mayor of Ellesmere Port, Councillor Bob Crompton will be welcomed at Ellesmere Port Station during the event. The exact celebration day is July 1st and five days later on July 6 there will be an open day at Ellesmere Port Station as well as a special train running along the line. The train leaves Liverpool Lime Street at 9.42am and is an opportunity to travel the whole line from Hooton to Helsby on one train and to cross the Halton Curve on the return journey. The train calls at Ellesmere Port at 10.47am, 12.20pm and departs back to Liverpool at 1.17pm. At Ellesmere Port Station between 12 noon and 1pm the Mersey Morris Men will be performing and the itravelsmart Team will be on hand to encourage people to use public transport and will be offering free security chipping for bikes. Councillor Crompton said: “I am looking forward to welcoming visitors to Ellesmere Port Station and hope that they will join the celebrations at the station and on the special train. Also at Ellesmere Port Station, amongst others, will be Council leader Councillor Mike Jones and local Councillor Pat Merrick. A vintage bus service and a new Stagecoach bus will also operate between Helsby and Ellesmere Port in the afternoon; from Helsby at 1.35pm; 2.05pm; 3.00pm; 4.30pm; and from Ellesmere Port at 1.00pm; 1.25pm; 2.15pm; 2.45pm. Times are provisional and a donation is requested. To mark the special day there is free entry to the National Waterways Museum on production of a 6th July Hooton Helsby Day Ranger ticket. 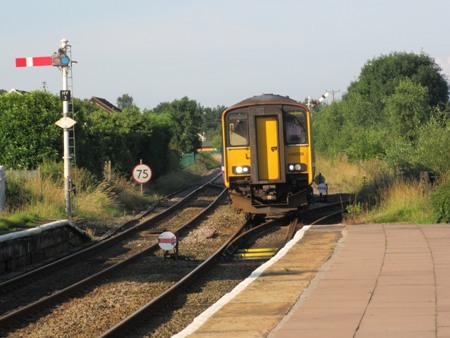 Tickets for the special train – Hooton Helsby 150 Day Ranger tickets – can be purchased at any staffed Northern or Merseyrail station from July1st. The cost is £10 for adults and £5 for children.